Registration is only $40 through March 31 for three-day conference in May that features a variety of experts discussing cutting-edge ideas for transforming American suburbs. Silver Spring, MD – The Montgomery County Planning Department, part of The Maryland-National Capital Park and Planning Commission, has opened registration for its Makeover Montgomery 4 Conference (MM4), to be held May 9 through 11, 2018 in College Park and Silver Spring, MD. The cost of the conference is $40 and can be paid online through March 31. After March 31, the registration fee is $55 and goes up to $65 at the event. 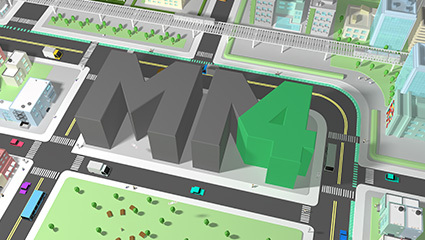 Register for the MM4 Conference. MM4 will begin with a presentation by keynote speaker Peter Leyden, who will reveal the societal and economic trends shaping the future of our communities. Leyden is the founder and CEO of San Francisco-based Reinvent, a network of innovators using the new medium of group video to brainstorm ideas about how to change America. He is an innovator and entrepreneur who has worked for a series of pioneering organizations, including Wired magazine, the Global Business Network and New Politics Institute. Leyden’s keynote address will take place at the University of Maryland’s School of Architecture, Planning and Preservation on May 9 at 7 p.m.
How must American suburbs change to be competitive in tomorrow’s economy? These sessions will tackle issues related to developing a diverse, educated and sustainable workforce, as well as other strategies for economic development and job growth. Topics include workplace innovations, mixed-use strategies and building the creative culture necessary to succeed in emerging markets. What can suburban communities do to encourage active lifestyles for their residents? Advancing state-of-the-art approaches to increase walkability, reduce the stress of cycling and enhance recreation opportunities, these sessions will identify ways to create energized and engaging public spaces for healthier communities. Additional topics will include access to healthy food and innovative concepts like park prescriptions, which partner parks departments with health insurers and medical doctors to encourage healthy living through exercise and outdoor activities. How can our increasingly diverse suburban communities promote equity for all? These sessions highlight efforts to inspire and educate community leaders to tackle environmental justice issues, advance opportunities for affordable housing and uphold tenant rights. How will advancements in technology improve public services, change how our communities function and impact growth patterns? These sessions will address the planning-related impacts of big data and crowdsourcing analytics, and the current use of data sensors and smart technologies. Additional topics will include the integration of autonomous vehicles and the role of technology incubators. Makeover Montgomery 4 is being organized through a partnership between the Montgomery County Planning Department and the National Center for Smart Growth at the University of Maryland. The 2018 event follows similar conferences in 2016, 2014 and 2011 held by the Montgomery County Planning Department and the National Center for Smart Growth. View the recap video from the 2016 Makeover Montgomery 3 event. Please visit www.makeovermontgomery4.com for more information. Questions? Please contact Jason Sartori at Jason.Sartori@montgomeryplanning.org.